DIRECTORATE OF TEXTILE AND JUTE MINISTRY JOB CIRCULAR 2019! Are you looking at a Government Job Circular? Dear Friend, the Ministry of Dot Successfully publish a Job Circular. The Job Circular will be Publish on 01 March 2019 and Job Application Last Date is 15th March 2019. It’s a Government job Circular. You know that now a days government jobs are very attractive for Bangladeshi people. The Ministry of Textile and Juts finding a new job holder of position many other posts. If you want a government job. Dear Friend, we hope that it’s a bet opportunity for you to Apply for the Job. So you may check the ministry of textile and jute job circular 2019 given below on image file If there have any position match with your educational qualification and required experiences. 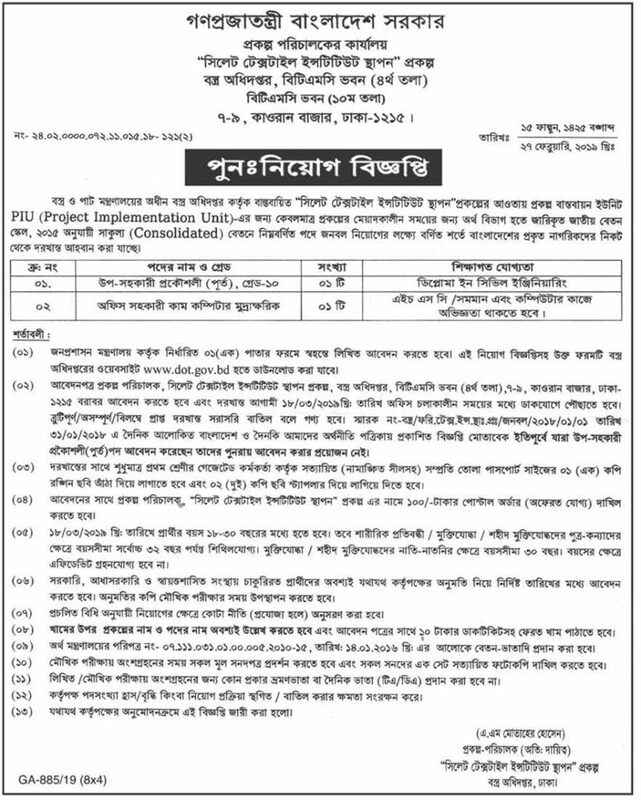 So check textile and jute ministry job circular 2019 in this post. We added all the information about the Job Circular. Do you have any question about textile and jute ministry job circular, Just Comment Here? We solve your problem as soon as possible. Thanks for staying us.